The first half of The Greatest Game Ever Played is so full of sports movie clichés and verbal anachronisms (“Get out! That’s President Taft? !”) that I questioned the critics who praised the film when it was released theatrically. Maybe I was more cynical, or maybe it lost some impact on home video. But by the film’s predictable ending, I was ready to cheer with the rest of them. I couldn’t say exactly where I was won over, but it was probably the characters that made the difference. Rather than the usual underdog-versus-sneering villain, The Greatest Game has a “villain” who’s not very mean, and who in fact has a lot in common with our underdog. Rather than hoping to gloat over a Malfoy’s comeuppance, we actually don’t mind if they both play a great game. Actor Bill Paxton tried his hand at directing five years ago with Frailty, a 90%-good movie ruined by a lousy ending. Since then he’s acted in Club Dread and some Spy Kids movies. Now he returns to directing with this story of the 1913 U.S. Open, in which Francis Ouimet (Shia LeBeouf, an American amateur with a ten-year-old caddy, tied with the world’s greatest golfer. The movie makes sure we know the humble roots of both of these men. 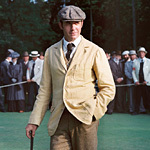 The childhood home of Ouimet’s competitor, Harry Vardon (Stephen Dillane), was razed to make way for a private golf course (at least in the movie), and Vardon spent his life as a gardener. Ouimet’s life is almost identical, but played out a generation later and across the Atlantic, in Boston. Both grew up around golf but found it impossible to break the class barrier that kept them from being full members in any club. So when they finally meet on the links, we can almost root for both of them, and The Greatest Game Ever Played gives us better suspense than many sports movies that have a snotty, haughty favorite just begging for an underdog to whoop them. The DVD includes A View from the Gallery: On the Set..., two audio commentary tracks (one with Paxton, one with screenwriter Mark Frost), and profiles of the real people portrayed in the film.